The new XLT and Wildtrak Ranger are easily city SUVs that do not in any way wear the looks of the traditional workhorse. The gleaming machines glided through the streets of George onto the gravel roads and up the Outeniqua Mountains, using the winding tracks once treaded by the wagons of the early Dutch people that settled in these parts. These are rarely used tracks and it was left for the journo-drivers to turn a switch to change from easy terrain driving modes to 4×4 mode to enable them pave their way, guiding the XLT and Wildtrak Ranger over rocks and stones, avoiding sharp-pointed rocks on their right and very deep canyon on the left. There were no ugly incidences, fortunately, and the convoy reached the top of the Mountain where Ford had its camp. The drive went further through the tortuous paths to Louvain Guestfarm, a tranquil working farm in the upper Langkloof valley. After the climb, the Rangers performed seamless movement down the mountain and off to George city. 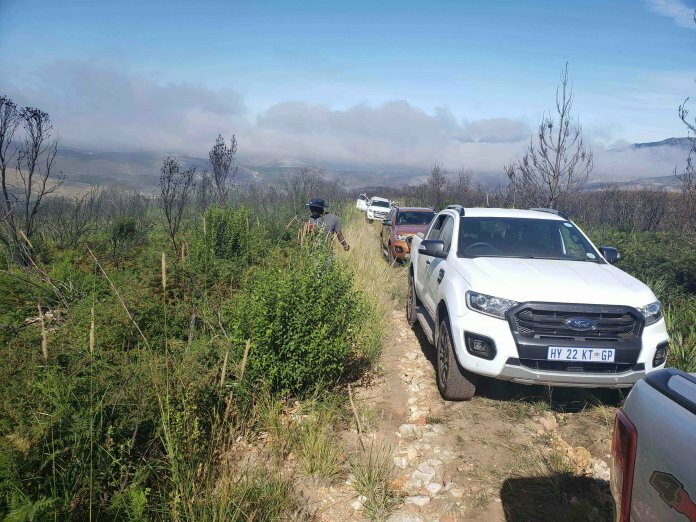 Oh, there is still the charred remains of the once lush vegetation of the Outeniqua Mountains caused by the unfortunate wildfires of last year. Ford said, with the launch of the New Ranger for 2019, it has raised the bar further in the ultra-competitive light commercial vehicle (LCV) segment. Featuring an extensive range of mechanical, technological, feature and comfort upgrades, the new line-up will make the Ranger an even more compelling choice amongst workhorse and leisure-oriented pick-up customers, the automaker said. “The current Ranger has been a fantastic success story for Ford in Sub-Saharan Africa, and is the leading LCV export to markets in Europe, the Middle East and the rest of Africa,” says Doreen Mashinini, General Manager Marketing at Ford Motor Company Sub-Saharan Africa (SSA) Region. “The New Ranger introduces fresh exterior and interior design cues that build on its ‘tough truck’ image, complemented by the adoption of new technologies that further bolster the Ranger’s established reputation for supreme safety, convenience and comfort,” she adds. The model line-up has been revised for New Ranger, with the new XLS series slotting in above the entry-level Base and XL versions. The XLS offers superb value for money along with an impressive list of standard features. The Ranger Limited makes way for an enhanced XLT specification in SSA, and the range is topped off as usual with the exclusive and luxuriously appointed Ranger Wildtrak. The lower bumper also presents a sense of solidity and strength through the centre beam that runs into the outer fog lamp areas. With a wider lower grille the new bumper complements and harmonises well with new front end. The same design execution has been applied to XL and XLS variants. The very popular Wildtrak, which now comes with HID headlamps and LED daytime running lights, has been intentionally kept more familiar with the vertical aspect ratio grille that also incorporates the ‘nostrils’ in its design. Along with a split centre bar and additional venting holes for cooling, the new design is more aggressive in its application but remains true to the Wildtrak DNA. The powerful five-cylinder 3.2-litre Duratorq TDCi engine continues to lead the range, delivering impressive performance and outstanding load-lugging abilities with a peak power of 147kW matched to 470Nm of torque. The dependable 2.5-litre four-cylinder Duratec petrol engine is also available in selected models, providing 122kW of power and 225Nm of torque, combined with a five-speed manual gearbox. The Ranger is already highly regarded for its impressive ride and handling characteristics, and the 2019 model range has benefitted from further improvements that result in significantly improved ride quality more akin to that of a sport utility vehicle (SUV) than a pick-up. The Ranger Wildtrak continues to be offered with leading active safety features, including Adaptive Cruise Control with Forward Collision Alert, Driver Alert System and Lane-Keeping Aid, and Auto High Beam Control. Ford’s award-winning SYNC® technology remains the cornerstone of the Ranger’s in-car entertainment system on the high-end models. XLT and Wildtrak models are equipped with high-end SYNC® 3 linked to the integrated eight-inch touch-screen colour display. Navigation is standard on the Wildtrak and selected XLT derivatives. XLS models use Ford’s SYNC® 1 with Bluetooth voice control and audio streaming, while XL and Base feature a Mechless Audio system with USB, iPod and USB connectivity.